Summer is just around the corner and warmer weather outside means turning on the air conditioner. But before you do that, there are some preventative maintenance steps to take so you don’t have an HVAC emergency during the hottest part of the year. Here are four things you need to do to make sure your home stays comfortable year-round. 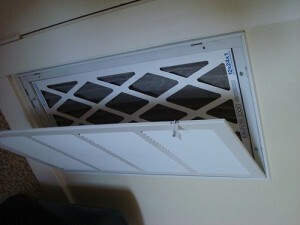 Prior to turning on your air conditioning for the season, you need to clean the outdoor part. Use a garden hose and spray the interior and exterior to remove leaves, grass, dirt, and bugs that have accumulated during the winter months. Next, trim nearby bushes back, keeping all plants three feet away from the unit to allow good airflow through the coils. Changing the filters for your HVAC system keeps it working well and efficiently. Filters catch and trap many allergens such as dust, pet dander, and pollen. Depending on the filter you use, will depend on how often it needs changing. If you go with the least expensive kind, a cardboard fiberglass filter, you should change it every month. If you choose a pleated paper filter, change that every three to four months. The pleated filters offer more surface area for the air to flow through and thereby, trap more irritants. If you are using a HEPA filter, clean it every six months with a vacuum cleaner nozzle and replace only when it shows wear. Some HVAC systems use an electrostatic filter fitted in a plastic frame. These are lifetime filters that need cleaning every two to four weeks to keep the filter working properly. The electrostatic filter does trap more dirt, dust, and hair and it costs around $30, but it must be kept clean. A new technological electronic filter can be installed on your unit and it does trap the most allergens, but the filter requires installation by a professional HVAC technician and costs around $1,000. The floor registers also need regular cleaning, and you can use the vacuum hose for this chore. To clean, first cover all the vents with a paper towel, tucking it around the edges. Then turn on your HVAC fan only. This will push the dust through the system, hence the need for the paper towel covers. Lift the first register and vacuum the dust being pushed out by the fan. Sweep as far down as your hose will reach. Continue this with each register, collecting the paper towels as your go. Don’t forget to clean the air return registers which are usually screwed into a wall. Unscrew and vacuum as you did the floor vents. It is always a good idea to have your HVAC system checked once a year by a licensed HVAC contractor. Make an appointment with a qualified technician to thoroughly inspect the major components of your heating and cooling units. It is better to have the system checked annually, so problems don’t develop when you need the unit the most. Preventive maintenance is a crucial part of keeping your home comfortable, no matter what the weather is outside. With these four tips, your AC system will be stay in tiptop shape.